Researcher Alden Loury speaking with Lake Effect's Joy Powers. 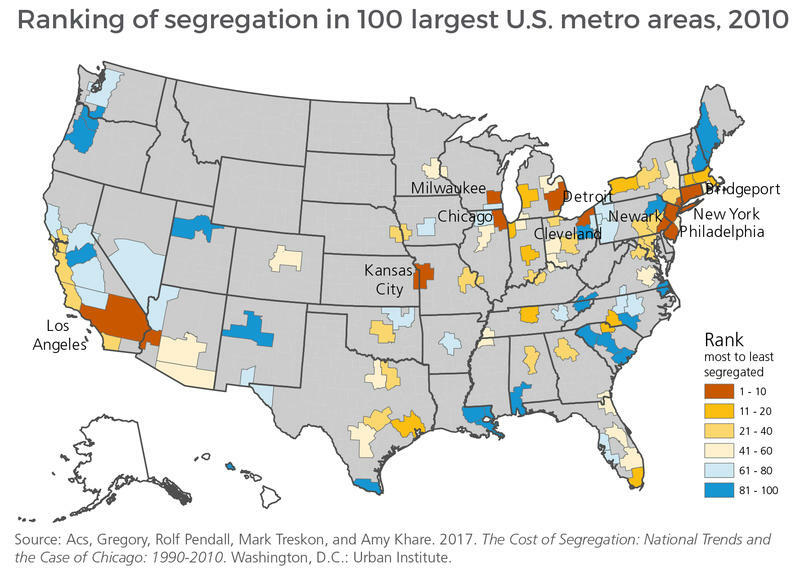 A new study out from the Chicago-based Metropolitan Planning Council, with the Urban Institute, has quantified how segregation may affect a region’s economy. The Cost of Segregation looks at the impact of segregation on the Chicago area and compares it to the 100 largest U.S. metropolitan areas, including Milwaukee. The report singles out three main indicators that would benefit from decreased segregation: income (personal and regional), education and safety. While some of the numbers are specific to Chicago, much of the data is simply comparing how hyper-segregated regions can benefit by decreasing segregation to median levels. 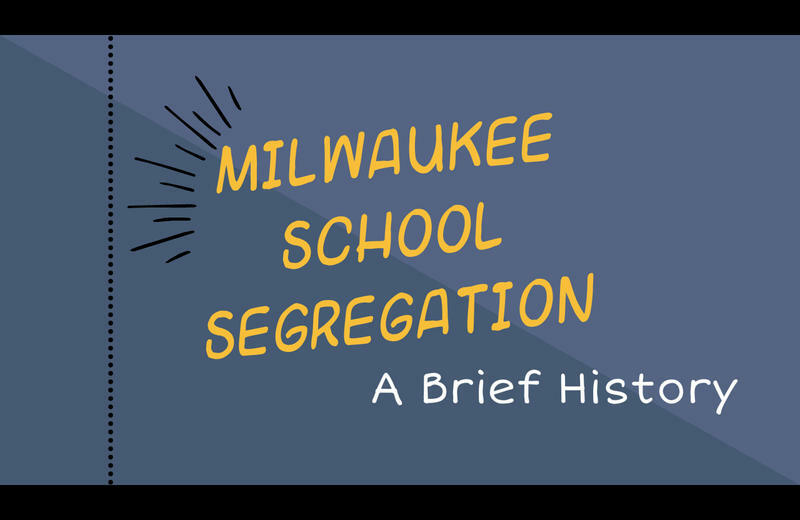 "When we talk about the cost of segregation, essentially we're talking about the difference between what we see now with our level of segregation and what we could expect to see if we were less segregated." 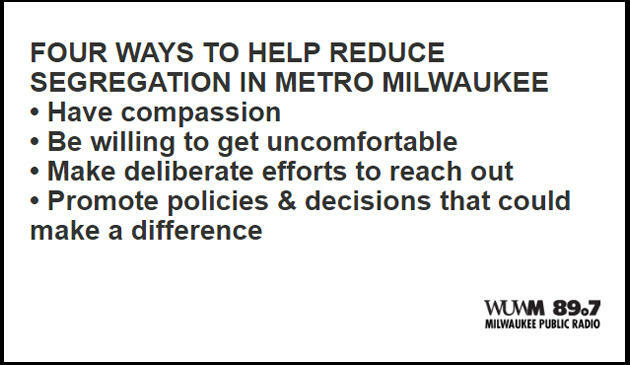 "Within any of those 100 largest metros, these three statistically significant findings that we're reporting on, those things hold true for all of those," says Alden Loury, director of research and evaluation at the Metropolitan Planning Council. "When we talk about the cost of segregation, essentially we’re talking about the difference between what we see now with our level of segregation and what we could expect to see if we were less segregated to the degree that we were essentially in the middle of the pack among the 100 largest metros in the nation," he explains. Like Milwaukee, Chicago is a hyper-segregated city. If the city were able to decrease segregation to median levels, the report found that could translate to incomes for African-Americans rising an average of $2,982, with the region as a whole earning $4.4 billion more in income. The report also states that hyper-segregated cities would see the homicide rate drop by 30%, which would save money on policing, legal and corrections costs. Decreasing homicide rates would also increase residential real estate values, and for the Chicago area, values would be increased by $6 billion. "Regions across the country should see their level of segregation as a potential impediment to their attractiveness," says Loury. "...They should be thinking it could benefit [them] in terms of [their] broader attractiveness from a competitive standpoint with regard to commerce, retail, so on and so forth." "Regions across the country should see their level of segregation as a potential impediment to their attractiveness." The final marker the report looks at is education: Decreasing segregation in Chicago could mean 83,000 more people earning bachelor's degrees. Interestingly, the study found that both white and black students tend to benefit from desegregation. Loury says this indicator can be particularly important for businesses and companies looking to move into an area. "One of the very critical things that they look at is the education level of the people in that region. Generally speaking those are higher earners, they're going to have more disposable income to spend," he says. "But if you're also looking for a credible job market, you're going to look at areas with higher levels of college degrees as areas that are going to produce or have available, greater talent."